Can Bonita Repeat Last Season’s Success? Bonita hoisted the Smudge Pot after smashing San Dimas 41-20 in 2010. Can Bonita, a 41-20 Smudge Pot victor over San Dimas last year, defeat San Dimas again on opening night, Thursday, Sept. 1, at 7 p.m. at Citrus College? Can the team run the table as it almost did last year in compiling a 12-2 season record — coach Eric Podley’s best in his 13 years at Bonita — before losing a heartbreaker to West Covina in the finals before 10,000 fans? So many questions, so many holes to fill. With the exception of returning center Nick Pichotta, the entire offensive line is gone. The entire defensive line is gone. All the linebackers are gone. The quarterbacks are gone. Looking at those kinds of holes, you would think Podley would never leave his office. He could just wear his athletic director’s hat and let somebody else handle the headache of what can only be termed a massive rebuilding project. Take a sabbatical coach. In the end, not even 300 Spartans were able to with stand the Persian hordes at Thermopylae. The hole-filling started over the summer, including passing league tournaments hosted by Arroyo and Ayala High Schools in addition to Bonita’s own tournament. Call Podley a riverboat gambler with amnesia, but he thinks this 2011 team could be one of his most talented. “I think we can contend for a league title,” he said. Taking the reins at quarterback will be 6-foot-1 sophomore Tanner Diebold, who will be backed up senior Aaron Burgett, who piloted the JV offense last season. Meanwhile, talented sophomore Joey Halabrin is penciled in as starting quarterback for the JVs. Early on, Podley won’t expect too much from Diebold. Fortunately, Diebold has that luxury of handing the ball off to a bevy of backs headlined by returners Cameron Griffin, a senior, and Reggie Turner, a junior. Also in the mix are senior Seth Ballentine and sophomore A.J. Greco. The running backs will be following the blocks of an offensive line anchored by returning center Nick Pichotta. But after that, you better pull out your program for names and numbers. “After that, everybody else is going to be new,” Podley admitted. “It’s going to be a pretty good offensive line, and we’ve got some guys who can run a little bit,” Podley added. When Podley decides to go upstairs, Diebold will have some tempting targets to aim at. Wide receiver Garrett Horine returns for his senior campaign bigger and swifter than ever at 6-3, 205. “He’s going to be an outstanding receiver as he was last year,” Podley said. Senior Austin Venegas, who saw a lot of playing time last season, will also be a primary target, as will be Riley Brungard, just a junior. Senior Devon Fasana will see plenty of action in the slot. Podley also likes his new 6-foot-4 tight end, Ryan Ramirez, a junior. As for the kicking game, Brandt Davis was almost perfect last season, and no one came up bigger than in the championship game against West Covina when he punched through what looked like the winning field goal late in the fourth quarter. “We expect an even better year for him,” Podley said. On defense, Podley will rely on linebacker Pichotta to help engineer the formations. “He’s a pretty smart kid, a 4.0 guy who wants to be engineer. He’s going to make sure our guys line up correctly,” Podley noted. Flanking Pichotta will be linebackers Griffin, Turner and sophomore Thomas Loy. The defense will also benefit from the return of Jason Wells, not as a player, but as a coach. The former Bonita and University of Washington defensive star will be sharing his Division 1 coaching knowledge with the cornerbacks and safeties. And perhaps, that’s the biggest hole of all to fill – the psychological one. Last year’s 12-2 team got it done. “They approached the season with a determination I hadn’t seen since I have been at Bonita,” Podley said. “You could tell they loved playing and that they loved playing together. 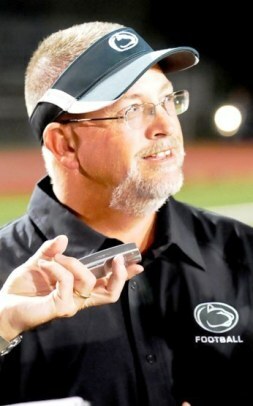 Bonita won’t be short on talent, nor will it be short on leadership – that 12th man. “Horine is definitely a leader,” Podley said. “He’s been nursing an ankle injury all fall and all summer, but when he’s on, he looks very impressive. In the Ayala tournament, he was like a human vacuum, sucking up everything in sight. Podley believes he has the ingredients for a championship run. He’ll toss those ingredients into the Smudge Pot at Citrus College on Sept. 1. and start to stir on the sidelines. Even though it’s just the opener, it has season-long and even career ramifications. 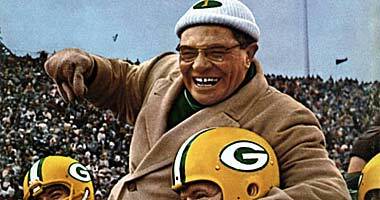 Does anyone see a resemblance between former high school coach Vince Lombardi and Coach Podley. Could Podley be riding on the shoulders of his players at league's end? Spaghetti Eddie’s, Eddie’s New York Pizzeria & Eatery, Tutti Mangia Italian Grill, Eddie’s Cucina Italiana. Try one, try them all. A night out is the perfect gift for everyone on your shopping list. Your gift card, although restaurant specific on the front, has a list of our other restaurants on the back so your recipient can use their gift card at any one of them for lunch, brunch or dinner. To order yours, click on the ad on LaVerneOnline.com or visit http://www.aimgroup.org. AIM stands for absolutely Italian!